Discover exciting South American destinations in gateway cities such as Lima, São Paulo, Buenos Aires and more. Enjoy premium hotel experiences in the heart of the action and explore activities and the rich culture of our South American gems. For a limited time, receive 25% off the daily rate when booking two or more nights and using offer code 25SAOF at participating hotels. See terms & conditions for other details. Book Now! Offer valid for reservations made in advance between 04/10/2019 and 05/30/2019 for stays from 06/01/2019 through 08/31/2019 at participating hotels. Must request offer code 25SAOF at time of booking to qualify for discount. A limited number of rooms are allocated to this offer; reservations subject to availability. Offer not valid with groups, conventions, other promotional offers, tour packages or special rate programs. Rate is per room, per night, based on double occupancy and excludes service charges, mandatory resort fees, applicable taxes and other incidental expenses. Additional charges may apply for additional guests or room type upgrades. Enjoy the 3rd night free to celebrate the opening of Grand Hyatt Bogota. A city full of culture, landscapes, history and nightlife. Bogotá, our newest Hyatt destination in Colombia is an extraordinary place to discover. 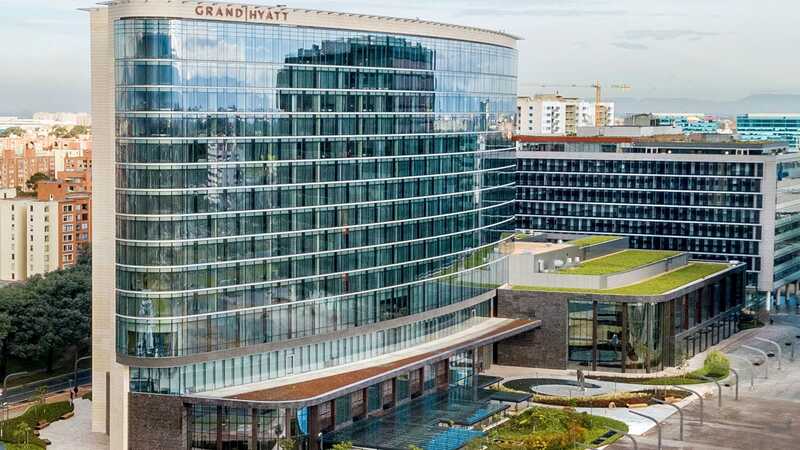 To celebrate the Opening of Grand Hyatt Bogota, we want to make it easier for you to enjoy it all and stay a little longer: as our Hyatt Guest, you can enjoy the 3rd night free plus breakfast when you book this spirited and exciting getaway. Offer valid for a limited time, please see terms & conditions for travel dates. Offer valid for bookings from 21-Feb-2019 to 21-May-2019 and travel from 01-Mar-2019 to 31-Dec-2019 at Grand Hyatt Bogta using offer code BOG3X2. All hotel reservations are subject to availability. Guest must book a minimum 3-night stay to receive the last night free and buffet breakfast. Free night is reflected at time of booking and, the rate is based on single and double occupancy. Additional charges apply for additional guests or room type upgrades. Taxes are not included. The additional free night must be used on the same stay. A limited number of rooms are allocated to this offer. No refunds or credit will be issued for unused portions and cancellation is allowed only 48 hours before arrival date. Offer is not valid for groups or convention, it may not be combined with other promotions and it is not redeemable for cash or other substitutions. Celebrate love with a memorable romantic getaway. As a guest of Grand Hyatt Bogotá you can enjoy a romantic stay with welcome amenities such as sparkling wine, red roses bouquet, “Love Ritual” kit and a romantic dinner with incredible views. Book this package and get room service or buffet breakfast for two and a 10% discount voucher for a treatment at Zaitania Spa. Please see terms & conditions for travel dates. Offer valid for reservations made 1 in advance between 01/04/2019 and 12/31/2019 for stays from 01/12/2019 through 12/31/2019 at Grand Hyatt Bogotá. Must request offer code ROMANT at time of booking to qualify for package, which includes: One time Sparkling Wine per stay One Time Red Roses Bouquet per stay One time Love Ritual Kit per stay One Time Macarons Welcome amenity per stay. Package inclusions are subject to availability and must coincide with guest’s stay at Grand Hyatt Bogotá. No credits may be used towards alcoholic beverages. A limited number of rooms are allocated to this offer; reservations subject to availability. Offer not valid with groups, conventions, other promotional offers, tour packages or special rate programs. Rate is per room, per night, based on double occupancy and excludes service charges, mandatory resort fees, applicable taxes and other incidental expenses. Additional charges may apply for additional guests or room type upgrades. Guest is responsible for all charges not included in package. No refunds for any unused portion of package. No substitutions nor replacement services or products offered for package inclusions. A portion of the rate for this offer may reflect taxes, service charges, gratuities, and third-party charges for certain included items, and those costs are not eligible for World of Hyatt® points. Promotional blackout periods may apply due to seasonal periods or special events, and normal arrival/departure restrictions apply. Hyatt reserves the right to alter or withdraw this offer at any time without notice. The trademarks Hyatt®, Hyatt Hotels & Resorts®, Park Hyatt®, Grand Hyatt®, Hyatt Regency®, Andaz®, Hyatt Centric®, The Unbound Collection by Hyatt™, Hyatt Place®, Hyatt House®, Hyatt Ziva™, Hyatt Zilara™, World of Hyatt™, Hyatt Residence Club® and related marks are trademarks of Hyatt Corporation or its affiliates. ©2018 Hyatt Corporation. All rights reserved. Rejuvenate, energize, revitalize and reconnect with the best version of yourself with a body or facial treatment. As a guest of Grand Hyatt Bogotá you can enjoy a spa treatment and a healthy snack at Zaitania Spa. Book this package and get buffet breakfast for two and a 20% discount voucher in our two restaurants. Please see terms & conditions for travel dates. Offer valid for bookings from 19-12-2018 to 31-12-2019 and travel from 27-12-2018 to 31-12-2019 at Grand Hyatt Bogota using offer code SPAPAC at time of booking to qualify for package, which includes: One time Spa Treatment for 2 per stay One time healthy snack for two per stay One time 20% off in a Hotel restarant per stay Daily breakfast Buffet per day. Package inclusions are subject to availability and must coincide with guest’s stay at Grand Hyatt Bogota. No credits must be used towards alcoholic beverages. A limited number of rooms are allocated to this offer, reservation subject to availability. Offer is not valid for groups, conventions, other promotional offers, tour packages or special rates programs. Rate is per room, per night, based on double occupancy and excludes service charges, applicable taxes and other incidental expenses. Additional charges may apply for additional guests or room type upgrades. Guest is responsible for charges not included in package. No refunds for any unused portion of package. No substitutions, nor replacement services or products offered for package inclusions. A portion of the rate for this offer may reflect taxes, service charges, gratuities, and third party charges for certain included items, and those costs are not eligible for World of Hyatt® points. Promotional blackout periods may apply due to seasonal periods or special events, and normal arrival/departure restrictions apply. Hyatt reserves the right to alter or withdraw this offer at any time without notice. The trademarks Hyatt®, Hyatt Hotels & Resorts®, Park Hyatt®, Grand Hyatt®, Hyatt Regency®, Andaz®, Hyatt Centric®, The Unbound Collection by Hyatt™, Hyatt Place®, Hyatt House®, Hyatt Ziva™, Hyatt Zilara™, World of Hyatt™, Hyatt Residence Club® and related marks are trademarks of Hyatt Corporation or its affiliates. ©2018 Hyatt Corporation. All rights reserved.